It’s not a real carbonara (which usually has raw beaten egg stirred in prior to serving; the heat of the cooked pasta finishes cooking the egg). The pheasant egg you see in the center was barely soft-cooked. It’s also not vegetarian. The sauce is just olive oil, ramp stalks, a couple of anchovy fillets, ramp leaves, wild arugula, parsley, mint, salt and pepper. Add cooked drained pasta to the skillet. Toss to coat. Taste for salt if necessary. Top each plate with some fried breadcrumbs and a soft-cooked egg, then serve at once. Time: Less than 20 minutes. 02 May	This entry was published on May 2, 2010 at 8:04 pm. 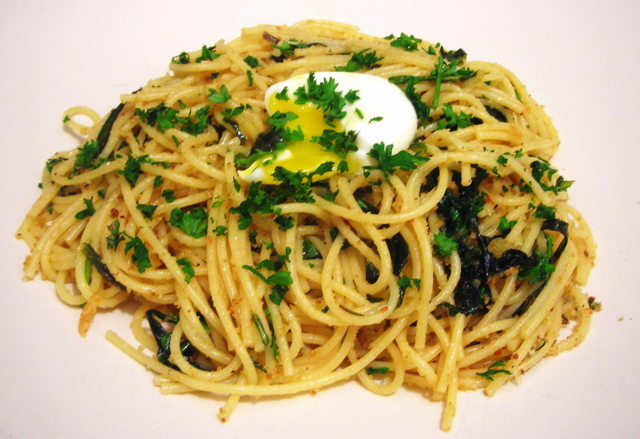 It’s filed under food, general, spring and tagged arugula, dinner, food photography, quick and easy, ramps, spaghetti. Bookmark the permalink. Follow any comments here with the RSS feed for this post. another lovely pasta dish; is there any ‘bad’ pasta? I doubt it.